Copyright © 2001, 2005 Aaron Shepard. All rights reserved. The legend of White Snake is one of the most popular tales of China, with countless versions in folklore, literature, and drama. As a legend connected to Hangzhou’s West Lake, it may have arisen as early as the seventh century. The thirteenth century saw the first literary versions, no doubt borrowed from professional storytellers in the streets of Hangzhou. It first appeared on stage in the fourteenth century, and the story is today one of the most often performed in Chinese opera. This legend, though, has changed drastically from its beginnings. In the earliest versions, Lady White truly was a man-eating demon, and the Buddhist and Taoist priests who intervened were heroes. Over time she was portrayed more sympathetically, and popular sentiment came to side squarely with the lady and her quest for love. Nowadays in China, political interpretations are also common—but the story can be approached from many angles. Just outside Hangzhou lies the wondrously lovely West Lake. This lake with its surrounding hills is a fairyland of lotuses, willows, peach and plum trees, pavilions, pagodas, temples, and ornamented boats. The White Snake legend came to be linked to Thunder Peak Pagoda, once the most prominent landmark of the south shore. The pagoda, though, collapsed in 1924—an event reflected in modern endings to the legend, like the one here. Another landmark in the story, Broken Bridge, is still standing despite its name. There are several ideas about how it got that name, but we may never really know. Zhenjiang (Chenchiang, Chinkiang), Gold Mountain Temple. Zhenjiang lies on the Yangzi (Yangtze) River and is connected to Hangzhou by the Grand Canal. Gold Mountain—actually a hill—was at the time of the story an island in the Yangzi, though the shifting river has now left it on the shore. There has been a combined temple and monastery there since around 400 A.D., and it may well have had a powerful abbot named Fahai. Kunlun is said to be home to the most important Taoist goddess, the Queen Mother of the West, along with other gods and human Immortals. Among these gods is “The Old Man of the South,” a nickname for the God of Longevity. He is in charge of the Star of Longevity—in Western terms, Canopus—in China’s southern sky. The job of this god is to decide how long each person will live. In pictures, he is often shown with the “miracle mushroom” at his feet. Chinese herbal medicine, miracle mushroom. Chinese herbal medicine still flourishes today, and herb shops much like Lady White’s are found in Chinese communities worldwide. Hundreds of “herbs”—most taken from plants, but others from animals, insects, or minerals—are given singly or in combination, and in a variety of forms—teas, pills, powders, cakes, gels, tinctures, and ointments. Illnesses are diagnosed by several methods, including analyzing the pulse and examining the tongue. “Miracle mushroom” is my own term for lingzhi (lingchih, lingchi, pronounced “LING-JEE”), known to Western scientists as ganoderma lucidum. It is a large woody mushroom that grows wild on decaying logs and stumps in coastal China. Once so rare and prized that it was used mostly by emperors, the mushroom is now cultivated commercially and sold worldwide, under those names and the Japanese reishi (“RAY-shee”). Herbalists recommend it for a wide variety of conditions, including AIDS and the side effects of chemotherapy. Dragon Boat Festival, realgar wine. The Dragon Boat Festival, named after the colorful boat races on that day, is one of the three most important holidays of the Chinese year. It falls on the fifth day of the fifth lunar month—about the first week of June. The festival is said to commemorate the death of Qu Yuan (“CHOO yoo-ON”), an ancient poet and royal adviser, though it likely started earlier as a solstice celebration. Because of the festival’s place in the White Snake legend, the story is often told or performed at this time. Formerly, it was the custom during the festival to drink wine mixed with realgar—arsenic sulfide—in the belief that the foul odor repelled snakes. These and other poisonous animals are at their most troublesome at this hot time of year, and the festival day is considered especially unlucky in this regard. Nowadays realgar wine is rarely drunk but may still be rubbed on the skin. Though I consulted numerous versions of the legend, I based my retelling on the best-known and most influential one from modern Chinese opera, by the eminent author Tian Han. 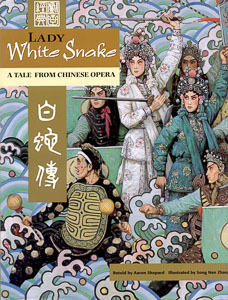 Two English translations of his libretto are The White Snake: A Peking Opera, by Tien Han, translated by Yang Hsien-yi and Gladys Yang, Foreign Languages Press, Peking, 1957; and “The White Snake,” by Tyan Han, translated by Donald Chang and William Packard, in The Red Pear Garden: Three Great Dramas of Revolutionary China, edited by John D. Mitchell, Godine, Boston, 1973. (Names here are as spelled in each book.) Though each translation has its strong points, the Yangs’ is generally more readable and accurate.